Inis, Revitalising, Body, Lotion, - 7 fl. oz. OMG Thats Chic > Inis Revitalising Body Lotion - 7 fl. oz. This is Inis's popular body lotion is enriched with deep moisturizing shea butter and skin-restoring ingredients from the sea. Packed with vitamins, minerals and trace elements that can help nourish the skin. Smooth on after a bath or shower to seal in moisture and leave skin smoothed and scented with Inis of the Sea. The sparkling scent that makes you feel happy. Nutrient rich seaweed extracts for lasting skin hydration. Deep moisturizing shea butte nourishes and protects the skin. Antioxidant rich Vitamin E and Provitamin B5 to help keep skin supple and conditioned. Made in Ireland. Paraben free and NEVER tested on animals. 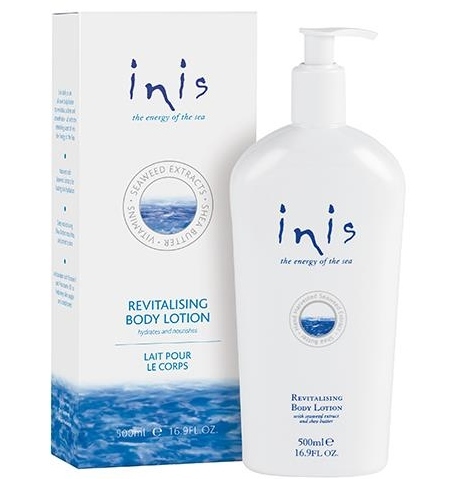 Inis Revitalising Body Lotion - Large Pump Bottle 16.9 fl. oz. 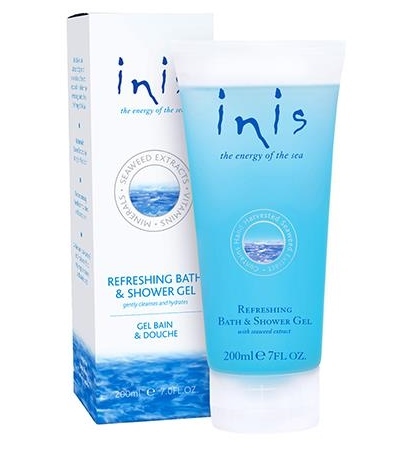 Inis Refreshing Shower Gel - 7 fl. oz.